I have a reasonable expectations kind of formula that I’ve been using for 25 years and it’s worked the whole 25 years almost perfectly. 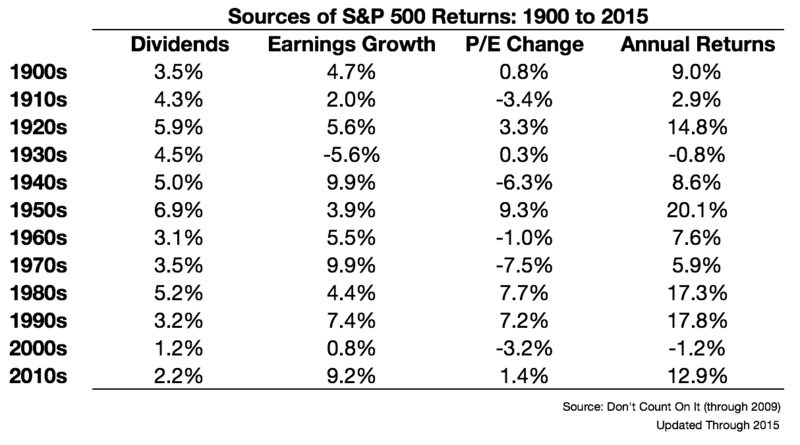 There’s some decades where it doesn’t work as well as it should but for the full period the reasonable expectations have been almost exactly the same as the returns actually delivered by the S&P 500. And it’s a simple system. And that is you’ve got a dividend yield that’s 2%. Going back a long time it was four and a half or five percent, so there’s a loss right there, suggesting lower returns in the future. Earnings growth has been about 5%. I think it’s going to be very tough to do that in the future, maybe we can do 4%. And stocks are highly priced. The first two are what I call investment aspects of the investment return and the second one is the speculative return — that is what will people pay for a dollar’s worth of earnings. He says this formula currently gives him an estimate of stock market returns in the 4-6% range, well below the long-term average that falls in the 8-10% range. You could quibble with some of the details here but I like the fact that this is such a simple model. Dividend yields are much lower now than the were in the past (something that can be partially explained away by the increase in share buybacks) while earnings growth and the P/E multiple expansion or contraction have been somewhat more volatile. What’s interesting here is how inconsistent the change in P/E has been decade-to-decade. At times high earnings growth has led to multiple expansion while other times it led to a contraction in the multiple people were willing to pay for earnings. Fundamentals matter over the very long-term but even over decade-long stretches investor sentiment can trump all. And the reason for this is because the P/E change is really a gauge of investor sentiment or emotions. When investors are feeling good they are willing to pay a higher multiple of earnings for stocks. When they are feeling nervous they are willing to pay a lower multiple of earnings for stocks. The problem with trying to forecast stock returns is that you’re really trying to guess how people will feel in the future. You could come up with a reasonable approximation of the impact of dividends and earnings growth over the coming decade and still be way off depending investor allocation preferences or where we’re at in the emotional phase of the cycle. And that’s all you can really hope for as an investor when dealing with an uncertain future. So what if Bogle’s formula is right over the coming years or even decades? Have a contingency plan in place if your expectations aren’t met (save more, work longer, spend less, start a side business, take on a new career, etc.). Plan for lower returns either way. If you plan for lower returns and it happens you’ll be ready for it. If you plan for lower returns and it doesn’t happen you’ll be even better off. But if you don’t plan for lower returns and it does happen you’re probably out of luck. If you’ve missed out on the huge bull market in U.S. stocks since 2009, don’t expect to jump in now and see similar performance. Diversify more broadly beyond U.S. equities in areas that have higher expected returns. Behavior and fees will matter more than ever in a lower return environment. Does a Change in Expectations Require a Change in Strategy? *Returns used here are nominal and don’t factor inflation into the mix, another potential reason for the changes in P/E multiples over time.